Michael has been in love with Francesca since the first time he saw her… at a party celebrating her upcoming wedding to Michael’s cousin John. Michael settles for becoming a close friend of Francesca. When John dies suddenly, Michael flees to India to escape his feelings for Francesca. Four years later he returns to London and discovers Francesca is in town looking for a husband. Of course, like all things Bridgerton, I enjoyed this book. Fast paced, humorous, lovable characters. 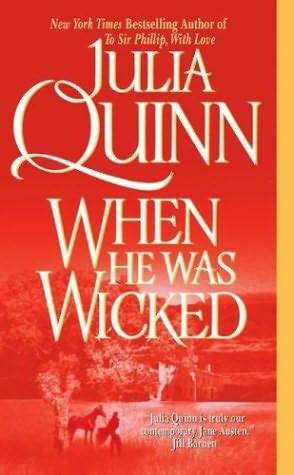 I am not typically a fan of the widow-falls-for-dead-husband’s-brother/best friend story line, but Julia Quinn handled it very well. But because of the plot, it’s probably my least favorite of the series. I enjoyed this book but was upset by the lack of Bridgertons. I do think it was by far her hottest of the series.